After years of failure, statistics reveal adolescent students leave high school without the reading and writing skills to succeed in the workplace. 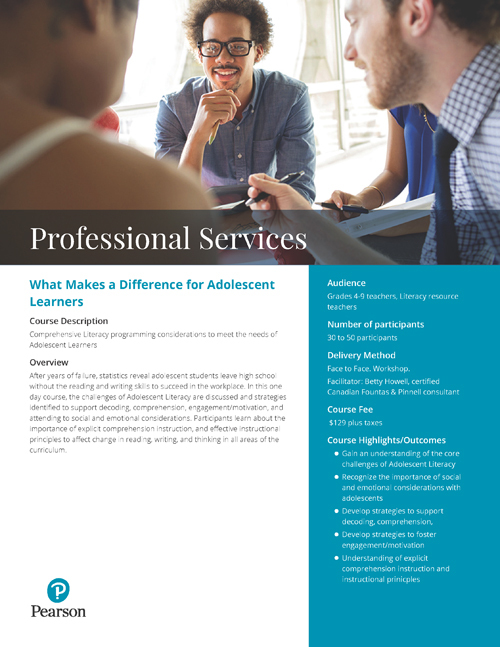 In this one day course, the challenges of Adolescent Literacy are discussed and strategies identified to support decoding, comprehension, engagement/motivation, and attending to social and emotional considerations. Participants learn about the importance of explicit comprehension instruction, and effective instructional principles to affect change in reading, writing, and thinking in all areas of the curriculum.